I do a big Costco trip at the beginning of the month – some produce, lots of meat, some cheese for the kiddos, a few other necessities. And I have to admit: I have a tendency to cart peek. You know what I mean…when you look at the contents of the shopping carts around you and compare them to your own. Confession: I am very judgemental about people’s grocery carts. More than once, I’ve considered stealing kids whose parents have carts full of nothing but frozen pizzas, Cheetos and Mountain Dew. But I’m noticing than more often than not, those cart ingredients just make me sad. Yes, I know. I’m terrible. I want to steal children whose parent’s feed them garbage and I eavesdrop on perfect strangers. All in the name of eating healthy. I watched a couple at Costco a few weeks ago – both quite obese, the wife with obvious hormonal issues – trying to make good choices by packing their cart with Healthy Choices frozen meals, Egg Beaters, diet sodas…discussing which ones tasted better than others, even reading the ingredient lists. 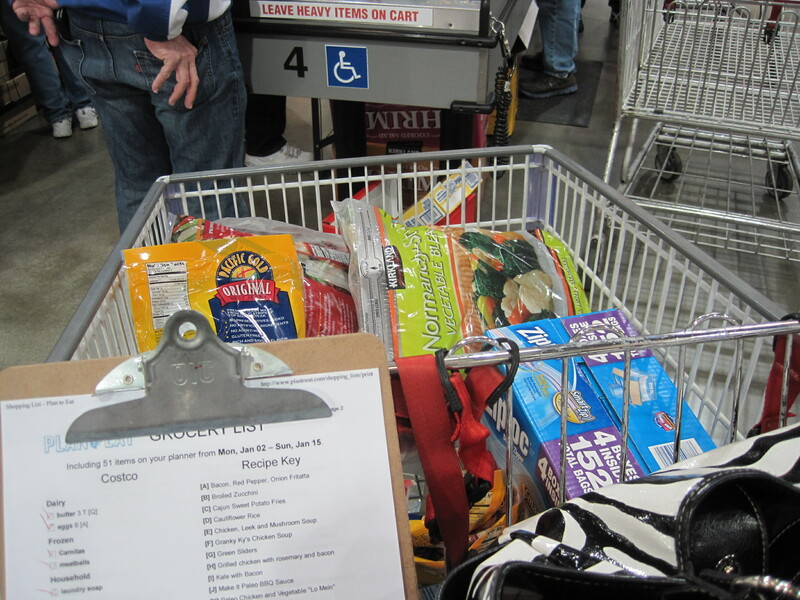 Their cart was full of food products that were all low-fat or no-fat, with chemical sugar replacements and very little real food. In reality, it was a cart full of chemistry experiments. They’re doing what television and popular culture, the media and the goverment are all telling them to do. And obviously, they are failing. Like I’ve failed. So many times. We’ve been told over and over to restrict our calories, to eat low fat or no fat, to read labels, to eat more whole grains, and to avoid the empty calories for last few decades. And still, the obesity epidemic has exploded. I came across this comment on Pinterest last week, and it struck me. We eat the way the government…or Weight Watchers…or the latest fad diet tell us to, not really paying attention to how it actually makes us feel or our bodies run. We’re so focused on what we shouldn’t eat that we no longer value food as a source of nutrition. We focus on getting through the day with as little calories as possible, often not caring where those calories come from. Instead of eating a food because of what good it does for our bodies and minds, we’ve turned it into a number game. I know people who would be happy to eat cardboard if it had few enough calories or points. And we keep doing it all over and over and over…praying that one of these days, it actually works. One of the things I love about eating a paleo/primal/ancestral diet is that I focus on what each food does for me. Quality and variety are important. Real foods are paramount, and with real food comes real flavor. It’s incredibly personal and customizable because ingrained in the very basics of a paleo or primal or ancestral diet is the knowledge that we need to pay attention. You can’t do that without realizing how different foods react with your body. I avoid grains because they make my stomach, joints and muscles hurt and they cause me mental fogginess, among other things. Dairy does unpleasant things to my digestion and my skin. And after a few weeks of really paying attention, I’ve seen what oils as opposed to fat do to me. It’s not pretty. I would love to walk that couple through Costco again – show them how easy it would be to throw together their own Healthy Choice-like bowls with a bag of frozen veggies and some chicken tenders…how to spend a few hours on Sunday afternoon planning and cooking for the week ahead…to skip the Egg Beaters and just eat one of nature’s best foods (unless you’re allergic)…how to eat real foods and see real changes that last. And I would ask them to pay attention to their bodies – it doesn’t matter if something is only 300 calories if you have no energy and can’t think, are bloated or having stomach issues after you eat it. We simply have to take the focus off of simply being thin or losing weight, and with that, of counting calories or points. About how we’re choosing to fuel our bodies. Tomorrow, come back and read about my personal Lenten challenge and how it fits with this. This entry was posted in Simply Paleo and tagged ancestral diets, diet, paleo, Primal, weight-loss by Awkward Girl Gets Fit. Bookmark the permalink. Loved this! I look forward to your Lenten challenge. It’s fun to see what others are doing! I love this post…I’m slowly converting my family to a more veggies/ more healthy meats/more healthy fats diet. Its not easy. While I’ve had a life time of paying attention to what is in the foods I eat, even being vegan once upon a time, my family has not really had that priviledge. My husband was raised on white bread and fast food by a single mom. While she has completely changed how she eats as time has gone on, my husband would rather eat a bowl of sweetened cereal than anything else. And heaven forbid if there are sweets in the house. He can’t say “no.” As I go about this process, the first step was to insist that what is on the menu is what we eat…ALL of us, and without fail. We started that in January and have for the most part done it. I lost 4 pounds just not letting my husband derail our meal plan (and our budget) with “I don’t feel like eating that. Lets get Panera.” I’ve had to resort to some sneaky stuff. Like I often “forget” to make a “starch” for me and my husband. I make a really good casserole that doesn’t contain veggies, normally…but I put a couple of handfuls in anyway. I make lots of interesting fresh fruit salads for my kids. (Honestly, that one is surprising to me, but they will nearly lick the bowl if I give them chopped up fruit combos!) My kids have both given us fits with eating what the family eats. I have actually battled to the point of putting children to bed over eating what is on their plate. Because the 2 year old loves starches, we don’t let him have that first. He would eat that and nothing else. So, first he must eat his protein and his veggies. THEN he can have starches. He’s twice made it to the point of putting on pajamas to go to bed before he waved the white flag and agreed to eat his meat. You are so right…it is NOT easy…and there is TONS of conflicting information out there! BUT we’ve had a couple of pretty interesting breakthroughs lately. I put broccoli on Jay’s plate the other day and he just ate it. There was no whining or trying to hide the taste with something else or asking if he HAD to eat it. He just ate it and that was that. The other one involves processed food. I still buy frozen chicken nuggets for the nights when I’m not home to cook a meal. My kiddos wanted nuggets the other night and I indulged them…and Jayden commented that they tasted kind of sweet…and asked if chicken was supposed to be sweet. BINGO…he’s tasting what he puts in his mouth. Its the little things. But I know if I cook well and make small changes as we go, by the time they realize that things are drastically different, they will like what we eat. PS…I’m guilty of grocery cart judgements too. HEE HEE!!! I think that’s a huge victory – getting kids to realize that the way foods taste isn’t how they’re supposed to! I grew up in a house where broccoli was smothered with mayonnaise and my Dad is mourning the recent loss of his Schwann’s delivery. The more processed the food, the more he loves it. I still struggle to get Caleb to eat more veggies (he is a pro at broccoli) and Hanna has hit a teenage pickiness that seems to crave soda and junk. I’m okay with the occasional treats…so long as they truly are treats and not a daily occurrence. We had 3 straight nights of victory dinners last week where everyone ate what was put in front of them and loved it. I live for those nights!